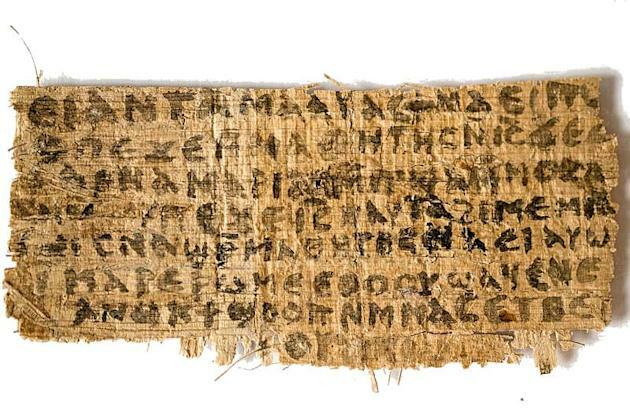 In 2012, the discovery of a tattered papyrus fragment rocked the biblical studies community after some alleged its text proved that Jesus was married. Now tests show the fragment is not only likely legit — it's also superold. The controversial fragment known as the "Gospel of Jesus's Wife" dates to between the sixth and ninth centuries, and could possibly date back as early as the second to fourth centuries, according to a newly published study in the Harvard Theological Review. The fragment, which contains the words, "Jesus said to them, my wife," first came to light several years ago. Harvard University Divinity Professor Karen L. King, who announced the fragment's existence at a conference in 2012, was quick to point out that the fragment does not prove that Jesus had a wife. "The main topic of the fragment is to affirm that women who are mothers and wives can be disciples of Jesus — a topic that was hotly debated in early Christianity as celibate virginity increasingly became highly valued," King said in a statement. The document first came to King's attention in 2011. She had it examined by Roger Bagnall, director of the Institute for the Study of the Ancient World at New York University. Bagnall's initial findings were that the fragment was ancient, which lead to more testing. Not everyone agrees that the document is legitimate. Brown University professor Leo Depuydt wrote a rebuttal to the findings in which he calls out "gross grammatical errors." He said the fragment is so clearly a phony that it "seems ripe for a Monty Python sketch." In an interview with the Boston Globe, King said, “I’m basically hoping that we can move past the issue of forgery to questions about the significance of this fragment for the history of Christianity, for thinking about questions like, ‘Why does Jesus being married, or not, even matter? Why is it that people had such an incredible reaction to this?’ "
The fragment measures 1.5 by 3 inches. Its author is unknown.